WinFF is a handy video file converter that helps to batch convert videos and provides preview facility. Thus, you can watch how output video will look, before starting the actual conversion process. It is a Graphical User Interface of FFmpeg (that includes huge audio video codec library to convert videos), so you will be able to convert almost any video file, such as: mp4, vob, avi, flv, mkv, ogg, mpeg, etc. It is also useful to extract audio from video files or convert audio to video. What makes WinFF different than many similar video converters is that it supports output for different devices. Like you can convert videos for phone (blackberry, iPod, Android, etc.) compatible formats, PSP, websites, etc. Each device/format contains multiple presets to start the conversion. For example, for mobile formats, it supports 3gp, 3gp2, and mp3 presets. How To Use This Free Video File Converter? Just few steps are required to convert multiple videos together with this free video file converter. After you download and install this product, you can open the interface to add videos for conversion. Its setup file is 18.3 MB in size and you can download it from the link I have placed at the end of this review. Interface of WinFF supports drag n drop feature to easily add multiple video files to bulk convert them. After adding the video files, simply select output device or format, preset of selected format, destination location, and start the conversion with Convert button. Immediately, command prompt window will open up to start the conversion process, and each input video will be converted frame by frame. Conversion process would be slow, depending on selected output format, size and quantity of input videos. If you are not sure how output video will look, then it is better to first preview the output using available button. Video: It is used to manually set video bitrate, frame rate (15fps, 24 fps, etc. ), video size (height and width), and to set video rotation. Audio: It provides similar options, like video option, but for audio. You can set audio bitrate, sample rate, audio channels, and audio volume. 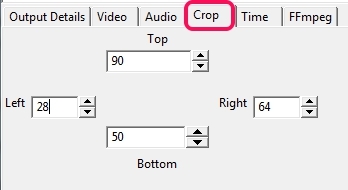 Crop: This feature will help you to crop output video size from top/left/bottom/right. Time: One of the interesting feature is to set seek (starting) time for converting videos and to set total time duration for recording videos. For new users, it might be a difficult task for users to set right values for all these settings. Therefore, there must be some preset details available for all these features. Like it is possible with some audio video converter tools, such as Apowersoft Free Online Video Converter, Easy-Data Mediacenter Video Converter, SuperSimple Video Converter, etc. WinFF is handy for converting almost any kind of videos. The fact that it is based on the very popular FFmpeg mean that it can support tons of video formats out there and provide all sort of customization settings.